We are pleased to have permission to use this image by Shirley Gallant, a wildlife photographer and member of the Natural History Society of PEI. 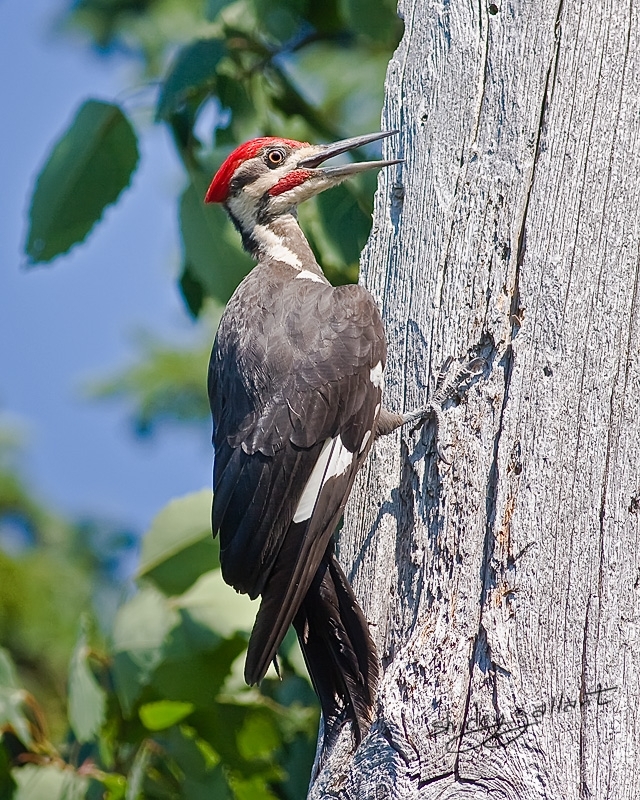 The pileated woodpecker, is a species that tells an important story of both the resilience and the vulnerability of many creatures on Prince Edward Island. At one point this native species was extinct on the Island. Local extinction, or extirpation, meant that this forest loving bird which requires sufficient old growth forest to survive could not manage amid extensive logging and loss of habitat on PEI. Some people thought this would be an end for this species on the Island, but amazingly this majestic bird – the largest woodpecker native to the province has begun a tentative return. While limited to only a few birds in locations that can support them, this image taken by Shirley proves they are no longer a ghost in the forest; they are now resident on the Island, as pileated woodpeckers attempt to establish themselves on PEI. Try as they might they need help to ensure that sufficient woodland habitat survives. One unique area where these birds are now active is Strathgartney Provincial Park where they have been sighted twice in April, 2010 in the old growth woodland that contains as stand of American beech which remains rare on PEI; both times the bird was heard calling. A year later on April 29th, 2011 a female was seen at this site by Lois Doan.